This is Banner Girl and Words Clear Set and she is so cute! This set actually comes with a blank banner and NINE different sentiments that fit in that blank banner. It is so awesome that you can make so many different cards with this set!! I colored her up with Copics and then trimmed her out and popped her up on some foam dots for depth! Oh she is so sweet, Kel! 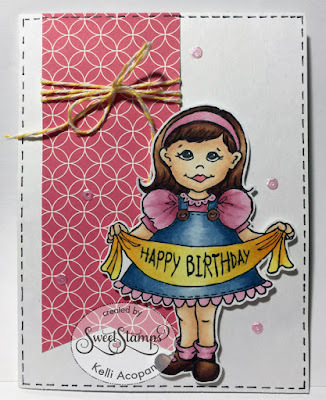 Lovely little girl card! Awesome coloring, as usual! Hugs! Sweet card, beautiful coloring and love the faux stitching. Love your coloring- and the faux stitching and sequins are fabulous!